Last week (which you can probably see below), I did part 1. 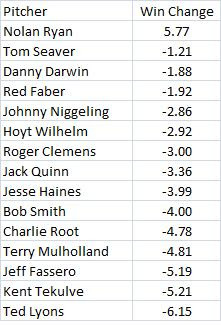 This week, I tried to put a win value on the change in performance for pitchers as they aged. I looked at all pitchers who had 500+ IP from ages 35-39 and 200+ IP from ages 40-44. One stat I looked at was RSAA (from the Lee Sinins Sabermetric Encyclopedia). It tells us how many fewer runs a pitcher gave up than the league average pitcher, adjusted for park effects. There were 53 such pitchers. 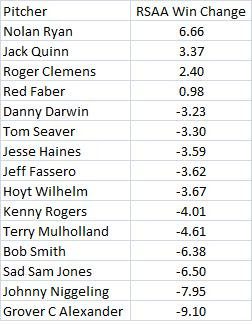 Last week I looked at how these pitchers changed as they aged based their runs allowed per 9 IP, assuming a league average of 4 runs per game. The first thing I did this week was to look at how many games above the replacement level pitcher each guy was when he was younger and then when he was older. This involved calculating how many wins he would have using the Bill James pythagorean formula then subtracting from that the number of games a replacement would have won in the same number of IP (with games equalling IP/9 and the replacement percentage being .400). The leaders are below. Nolan Ryan is first. He was 6.66 more wins above replacement in the older years than in the younger years. Clemens does well at third place, but a good bit behind Ryan. for example, when Tom Seaver was aged 40-44 he allowed 84.78% as many HRs as the average pitcher, 80.65% as many walks and struck out 93.68% as many batters. Then .8478, .8065 and .9368 get plugged into the equation. The result is .9068. So relative to the league average and just based on pitcher controlled stats, Seaver had an ERA that was equal to 90.68% of the league average in his older years. In the younger years, his computed ERA was equal to 104.18% of the league average. That means that he improved by about .135 or 104.18 - .9068. 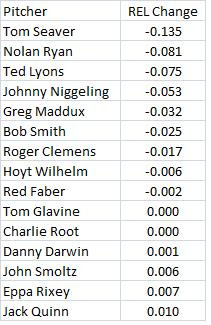 Clemens is up there but with only a slight improvement of -.017. or, he was 1.7 percentage points better. Although this method takes the fielders out of the picture, it is not adjusted for park effects. The last table does what the first table did but using the relative ERA from the above formula instead of using runs allowed per 9 IP based on RSAA. Ryan improved his value over the replacement pitcher by 5.77 wins. Clemens is up there, but he still lost 3 wins in value. Although this method takes the fielders out of the picture, it is not adjusted for park effects. "Here's a question I haven't seen answered yet: what kind of improvement could a pitcher expect from going on steroids? It seems like nobody knows the answer, but it doesn't stop anyone from looking for evidence in the statistics ..."
Well, if steroids can indeed help a pitcher with velocity, it can probably impact a pitchers strikeout totals, or something like k/9, which could result in a decrease in ERA. cyril, my mistake, I posted in the wrong one.